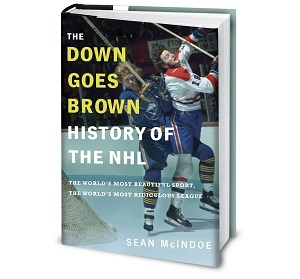 Down Goes Brown: 20 Cupless Canadian seasons - Which was the most painful? 20 Cupless Canadian seasons - Which was the most painful? Canadian hockey fans probably don’t want to talk about it. “It,” of course, is the nation’s Stanley Cup drought. With the elimination of the Montreal Canadiens, the country is now assured of going Cupless for the 20th consecutive season. During that span, we’ve seen Canadian teams fall one win short some years and not even come close in others. It’s all been very painful. But just how painful? Oh, we’re going to talk about it, Canada. We’re going to talk about it in detail. Specifically, we’re going to look back at each of those seasons, and we’re going to rank them based on just how much it hurt. It’s the only way we can begin to heal. Bandwagon factor: How much fun was the run? Was it a team that fans of other franchises could get behind, at least temporarily? Remember, any decent Canadian hockey fan’s default position is to root against the country’s other teams. But if the right story comes along, we can allow ourselves to get on board for a few weeks. Hope index: How close did the team come? The length of the playoff run obviously factors heavily here, but the quality of the team does too. There are some teams that win a round or two without ever looking like a real threat to win it all, while others can bow out early but still have felt like they were this close. Eventual heartbreak: Pretty self-explanatory — how badly did it all end? The previous two categories factor in here, too, since it always hurts more when you get suckered in by a fun team that looked like it really had a shot. We’ll award bonus points for losing in an especially painful and/or creative way. We’ll take those three categories, then use them to come up with an overall rating (not an average), which will be the basis of our rankings. All of which will allow us to answer the question: In 20 years of Cupless Canadian misery, which years were the worst of them all? It’s for the best, Canada. But it may hurt. Last team standing: The Vancouver Canucks, who were swept by the Blackhawks in the second round. Bandwagon factor: 3/10. This was a weird year. The first lockout had wiped out half the season, and even when play resumed it just never felt quite right. But the Canucks were likable enough, even though they’d already had a long run the year before. Hope index: 5/10. Canada had won eight of the last 11 titles, and the Canucks had fallen just one game short the year before. We pretty much owned the Cup at this point. Eventual heartbreak: 1/10. Ah, well, can’t win ’em all, right? Overall misery rating: 2.3/10. Remember, we had no idea what was coming. We just assumed this was a temporary blip. Last team standing: The Ottawa Senators, who lasted seven whole games before losing to the Rangers in the first round. Bandwagon factor: 1/10. You saw the part about it being the first round, right? The Canucks were the only other Canadian team to even make the playoff this year, and they were the ones we expected to go deep. Once they were out, it took everyone a few days to remember Ottawa was still alive. Eventual heartbreak: 5/10. Any seven-game loss is tough, and this one saw the Senators blow a 3-2 series lead by dropping a pair of one-goal games. Overall misery rating: 2.5/10. Shrug. After what was then 18 consecutive Cupless seasons, this one barely registered. Last teams standing: A four-way tie, with the Leafs, Canadiens, Canucks, and Jets all lasting six games in the first round. Bandwagon factor: 1/10. With four teams all going out within 24 hours (and a fifth, the Flames, eliminated a few games earlier), nobody had any time for bandwagons. Hope index: 2/10. There were five Canadian teams in the playoffs. Somebody had to last for a round or two, right? Eventual heartbreak: 5/10. Actually, this one needs an asterisk, because the Jets loss also spelled the end of NHL hockey in Winnipeg for 15 years. The franchise was known to be moving south once its season ended, so the elimination hurt. The others, not so much. Overall misery rating: 2.6/10. Pretty much all of which is due to the Jets. Last teams standing: The Edmonton Oilers and Ottawa Senators, both of whom lasted five games into the second round. Bandwagon factor: 6/10. Both teams had pulled off first-round upsets, and the Senators had won a playoff round for the first time in their history. If you were into underdogs, you could get behind these teams. Hope index: 2/10. They were nice stories, but nobody realistically thought either of these teams was winning the Cup. Eventual heartbreak: 2/10. Both got thoroughly stomped in the second round. Overall misery rating: 2.9/10. Four years and counting. The drought was officially on. Last team standing: The Toronto Maple Leafs, eliminated by the Devils in Round 2. Bandwagon factor: 3/10. This was right in the middle of the Mats Sundin era, and was one of four consecutive years that the Leafs were the last Canadian team standing. Many of those teams were reasonably likable. This one was not. In fact, by this point everyone other than die-hard Leafs fans hated this team. I can’t imagine why. They seemed like such a pleasant bunch. Hope index: 3/10. The Leafs took a step back this season and were just a 90-point team. And by now, the pre-cap league had firmly settled into the Wings/Avs/Devils era of dominance; if you weren’t one of those three teams, you were a long shot. Eventual heartbreak: 4/10. While everyone likes to pretend the Leafs immediately fell apart after the Tie Domi elbow, they actually took the Devils to Game 7. But their season ended with a 5-1 blowout loss, making it pretty clear this team just wasn’t good enough. Overall misery rating: 3.2/10. This was definitely the least painful of the (surprisingly frequent) solo Leaf appearances on our list. People always remember that marriage cheap fifa 14 coins is the tomb of love! Do not understand at the time, began to understand now. Indeed, the married life will be to play down the friction fifa 14 coins in the period love, more should be said to live in love as gone. I feel that little bit of married life the mid-point of each other will drop into my feelings. Over time, no love, there is another cheap fifa 14 coins way to deeper feelings of affection that is.